1100 N. 13th Ave., Melrose Park. Undated photo of the Normandy in Melrose Park. It once had diamond muntin windows. Photo courtesy of the book Melrose Park by F. Marbella. The majority of the houses in Melrose Park were constructed in the 1950's, but the village does have its share of kit houses. I believe this Sears Normandy was built about 1934 by Angelo and Frances Pinnella. The Normandy was sold only from 1933-1935. 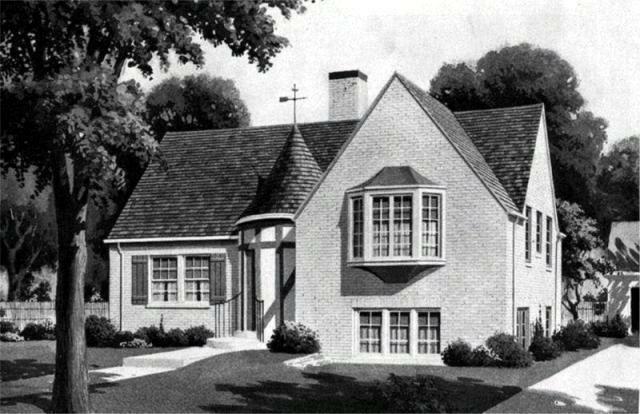 The Normandy in Melrose Park differs from the catalog illustration in some respects: there is a fireplace in the living room, there is a bay window in the dining room, the weather vane is missing, and there is a dormer in a front bedroom. Sears gave homeowners the option to build out a third bedroom above the living room (see floor plan below). I don't know whether the Pinnellas added this bedroom when the house was first built or sometime afterwards. Floor plan of the Normandy. Scan courtesy of Antique Home. The house was owned by the Pinnella family until 2007. The current homeowners are only the second owners since the house was built. I always forget Sears offered a few Tri-levels in the 1930's. Seems like a very modern design for that time. Guess that's why they were called Sears "Modern" Homes. Yes it was modern, Cindy! The split-level houses like the Normandy that Sears began selling in 1933 were some of the earliest incarnations of that design ever seen in the United States.